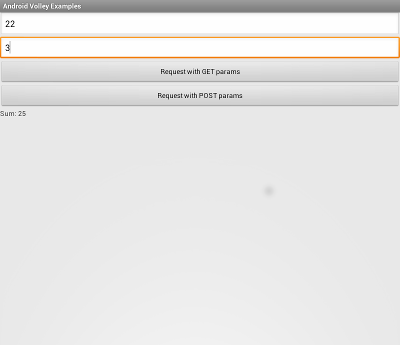 Just added a simple example how to use GET and POST parameters to the Android Volley Examples project. You can find it under "GET and POST parameters" button. Basically the example is quite simple: there is activity with two EditText fields used to enter a number and two buttons "Request with GET params" and "Request with POST params". You have to enter some digits in the fields, press one of the buttons and the request will be send to the server containing the parameters. Server will add the two numbers and return the sum which will be displayed bellow the buttons. In the code above num1 and num2 hold the parameters' values. This entry was posted by Ognyan Bankov on 2013-05-28 at 05:55:26	and is filed under Android. You can follow any responses to this entry through the RSS 2.0 feed. Responses are currently closed, but you can trackback from your own site. How can use setEntity(new StringEntity) in Android Volley? We are doing this in normal way by this method HttpPost.setEntity(). But is there a way of using in Volley? I'd like to use it for Twitter like below. Hey did you ever figure out how to use Volley with Twitter?